Today is my 25th birthday! This is the third birthday that I've celebrated on this blog (check out 2012 and 2011). I only got around to changing my polish around 11pm, so I was just going to put on some blingy glitter or something, but then I got this craving for a gradient and couldn't resist. Of course, I had to put a black and white glitter on top because UM HELLO black and white glitter is one of my favorite things! 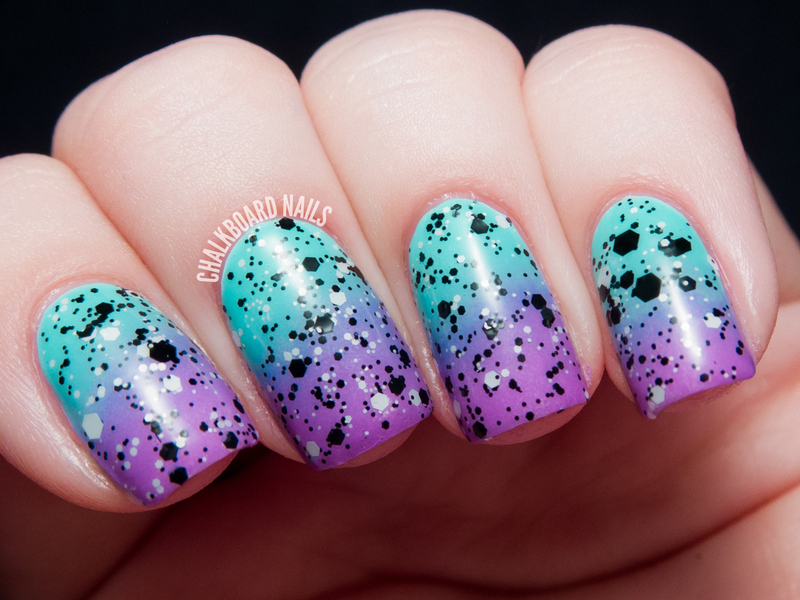 This manicure was created with four polishes. This look is actually pretty reminiscent of my "no sponge required" syrup gradient manicure. I did use a sponge for this version though, as neither of my gradient polishes are jellies. I prefer this color palette over the other, too! Tonight I am looking forward to enjoying a great dinner with my family at Benihana (I've been craving teppanyaki for MONTHS now!). These nails + onion volcano = winning. Keep an eye out for a few more posts from me today, including day three of the 12 Days of Giveaways! Happy birthday!! Love the colors! Happy B-day, wishing all your dreams may come true! Happy birthday! Love your mani! Love this mani! Great color combo. Happy Birthday! Happy happy birthday, beautiful mani! Happy birthday my one day apart fellow Sagittarian, although I have many, many years on you :) Gorgeous gradient combo and beautiful mani! HOW AWESOME!!!! Love it!!! HAPPY BIRTHDAY!!! happy birthday, this is perfect! Your nails are super duper gorgeous! :D I hope that you have a splendiferous day!! This is gorgeous! I love the color palette and the black and white glitter.